What struggle are you inviting or introducing into your organization? What if you circulated an email or wrote a blog post about how your organization could be more inclusive? What if you asked to have exit interview information made available to the entire organization? What if you asked the CEO what they were doing to ensure pay equity? What if you asked your supervisor what they do to check their blind spots and biases? What if you just started something? A reading club, discussion group, walking program? Everybody wants best practices and tools. Everybody wants to leave a conference with specific guidance on what to do and how to do it. There seems to be this idea that with the right tools, it will be easier or safer. 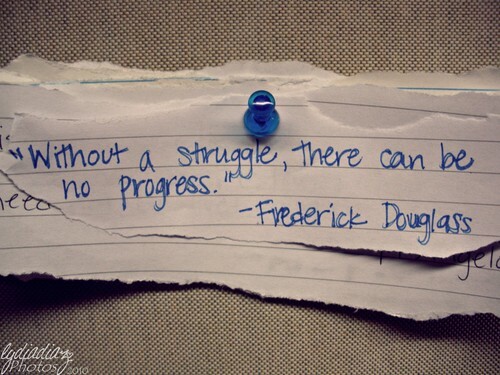 Change, progress, learning, evolution all call for struggle. They involve picking a fight … not with people, but with the current reality. Pick a fight. Your organization can do better. Eric Peterson at SHRM introduced me to your site and I wanted to send you a thank you note for such a great blog. I love that you are a “tree-hugger liberal” (I was raised by hippies) but that you take a quantitative approach to diversity and inclusion (I am a numbers geek) advocating for improved business outcomes through diversity. I am working on making my next career incarnation something in diversity and inclusion, hopefully having to do with program management and thought leadership, and I am always looking for new ideas. I am excited to see that you will be speaking at SHRM’s D&I conference in Chicago, I will be there too. I look forward to hearing your presentations and if you have the time or inclination to provide some career mentorship for someone like me, I would be very grateful for your wisdom and advice.